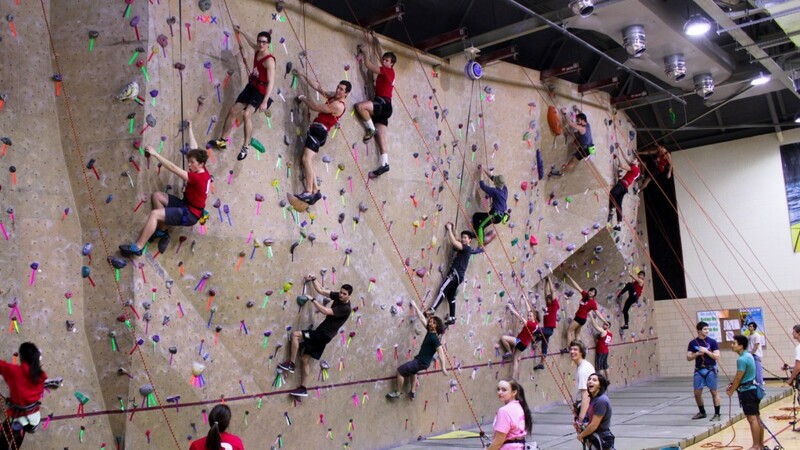 The Rutgers University Rockwall is located at the College Avenue Gym (best to enter from back of CAG). For classes, please click here, then click “Go Outdoors”. Experience the vertical world of rock climbing on our 2200 sq. ft. of sculpted terrain at the College Avenue Gym. Climb along sheer verticals, sculpted bulges, and horizontal overhangs, and feel the adrenaline as you hang onto a rock twenty feet above the floor. Come with a friend or be belayed by one of our staff members. All belayers must be certified by Rutgers Rock Gym staff, regardless of previous certifications at other gyms. For beginners, we offer free trial climbs!! Our staff will set you up with free gear and help you learn the basics of climbing indoors. Belaying is the technique climbers use to assist one another while ascending and descending. Want to become belay certified? Sign up for one of our 2-hour introduction classes and we’ll teach you the basic safety skills and techniques. For those with previous belaying experience, test out with our 10-minute skills test: available on a walk-in basis. For more information inquire at the Rock Gym front desk at 848-445-3691. Plan a birthday party, youth group outing, or special event at the Rock Gym. Student organizations can also rent out the space for scheduled group instruction or practice time for your club/group. Prices vary depending on the program and events. Call our Event Booking Coordinator at 848-445-1306 for details and to reserve a date. Click here to view our popular indoor climbing and birthday party rates. Click for birthday party request form.